The Screaming Eagle estate is owned by Tony Bowden and Jean Phillips, one of Napa Valley’s leading real estate agents. With help from Heidi Barrett and Gustav Dalla Valle, the operation’s debut vintage became the extraordinary 1992 Cabernet Sauvignon. Many people feel it’s one of the greatest young Cabernets they have ever tasted. The 1992 Screaming Eagle Wine has an opaque purple color. The wine is followed by a tantalizing nose of jammy blackcurrants and subtle toasty oak. The cabernet is intense, rich and creamy with elegant fruity flavors that linger in the mouth. 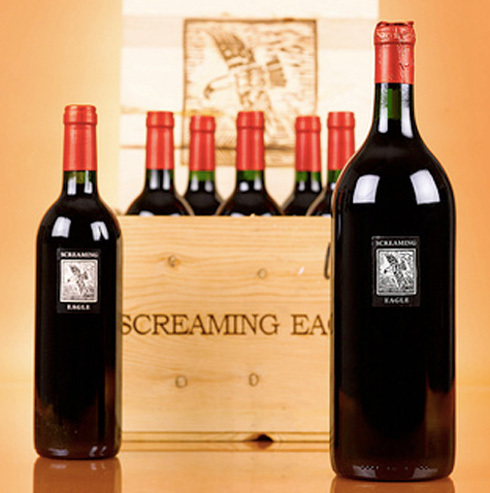 At a charity event named Auction Napa Valley 2008, a lot of six magnums of Screaming Eagle were sold for a whopping $500,000! That’s over $80,000 for a single bottle of 1992 Screaming Eagle Wine. In addition to the Screaming Eagle Wine, the winning lot included a dinner at the winery. The lucky purchaser was Chase Bailey, an executive at Cisco Systems, in the San Francisco Bay Area.